UPDATED: Thu., June 22, 2017, 11:23 p.m. The last time the Spokane Chiefs had two players drafted in the first round of the NHL Draft was 1997, when defenseman Brad Ference was taken 10th overall by the the Vancouver Canucks and Tyler Jones was selected 16th by the Chicago Blackhawks. Some 20 years later, it could happen again. Kailer Yamamoto has long been on NHL talent scouts’ radar, and fellow forward Jaret Anderson-Dolan, who is a bit of a longer shot to hear his name called on the first day on Friday in Chicago, has seen his stock rise as much as any player eligible in recent weeks. In the NHL Central Scouting’s final draft rankings, Yamamoto placed 17th among North American skaters; Anderson-Dolan ranked 21st, up from 40 in the midterm rankings released in January. Spokane winger Ethan McIndoe ranked 132nd on the final scouting list, while goalie Dawson Weatherill placed 25th among goalies. 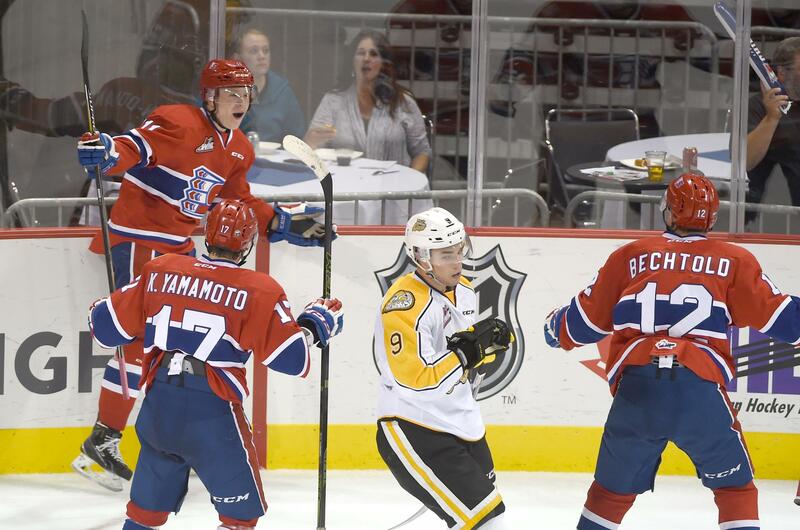 Yamamoto, 18, led the Chiefs in scoring with 99 points in 65 games, registering 42 goals and 57 assists, while Anderson-Dolan, 17, was right behind him with 76 points in 72 games – 39 goals and 37 assists. Yamamoto, a Spokane native and Mead graduate, is definitely proud to carry the banner of the Spokane and the Chiefs into Chicago for the draft. Both players are skilled scorers, strong skaters and willing leaders – good kids on and off the ice. But as they prepare to transition to the next level, with eyes down the road on the NHL, they also both share the same drawback on their scouting resume. It’s a question both – but particularly Yamamoto – have reluctantly had to face their entire careers. “I don’t think size matters,” said Yamamoto. At NHL predraft workouts, Yamamoto said he was questioned about his physical stature at every turn, but had the same answer each time. Yamamoto is listed at 5-foot-7, 153 pounds. Anderson-Dolan a bit stouter at 5-11, 185. That’s a far cry from NHL players such as Milan Lucic (6-3, 235), Joe Thornton (6-4, 222) or Alex Ovechkin (6-3, 240), players they’ll be expected to muck it up against in the big leagues. Shoot, the Chiefs’ first round pick in the Western Hockey League’s Bantam Draft this season, 14-year-old Jack Finley, goes 6-3, 185. Fortunately, Yamamoto and Anderson-Dolan have one of the best role models when it comes to a smaller guy having success at the highest level in hockey: former Chief and current Tampa Bay Lightning forward Tyler Johnson, himself a Spokane native. Johnson, listed at 5-8, 185, wasn’t drafted following a season in the WHL for the Chiefs when he scored 53 goals and registered 62 assists, becoming the 15th member of the Chiefs to hit the century mark. He led the team in both power-play and short-handed goals and accrued a host of WHL awards. Still questions about his size lingered, and he was forced to sign a three-year entry level free-agent deal with the Lightning in March of 2011. Of course, it has worked out pretty well for Johnson. Johnson was nominated for the Calder Trophy as top rookie in 2014 (eventually losing out to Nathan McKinnon of Colorado) and has a pair of 50-plus point seasons to his credit, including his breakout 77-point season in 2014-15. Johnson played in his 300th NHL game this past season while recording his 200th career point and 100th career assist. Yamamoto said he takes inspiration from Johnson, Derek Ryan and other smaller NHL stars such as Martin St. Louis. And he is often compared to another smaller but dynamic player, Calgary star Johnny Gaudreau. “Just watching them and being able to see that they can do in the NHL, how successful they were, it definitely helps me and what I can picture from me being in the NHL,” Yamamoto said. Johnson has been around Yamamoto since he was a kid. Along with Keanu, his older brother by one year and teammate with the Chiefs, Yamamoto took skating lessons as children from Debbie Johnson, Tyler’s mom. Johnson said he didn’t realize that he was that much of a role model. “It’s pretty humbling, to be honest,” Johnson said at the team’s announcement of new head coach Dan Lambert earlier this month. “I never really thought myself as that as I was coming up. I remember watching Derek (Ryan) play all the time – he was always a few years older than me, so he was always the best player in Spokane. I tried to emulate a little of his game, what he was doing. Anderson-Dolan’s rise on the draft board has come not only from his scoring prowess, nearly tripling his point total last season over his rookie campaign, but also due to his attention to his defensive game, a noted weakness in his rookie season but a strength last season. Some of his improvement might be attributed to comfort in a system, some of it simply growing into his body more. With the NHL systems specializing more in puck possession and zone play, Anderson-Dolan’s mantra is particularly apropos. Both players’ resumes including international play as well. Yamamoto has competed for Team USA at multiple previous events including the 2016 IIHF Under-18 Men’s World Championship, and this week was invited to USA Hockey’s 2017 World Junior showcase in advance of the 2018 IIHF World Junior Championship in Buffalo. Yamamoto helped the United States win the bronze medal at the 2016 IIHF World U18 Championship. He was the third-youngest player on the team but tied for the tournament lead with seven goals. Anderson-Dolan wore the captain’s “C” for Team Canada at the 2017 IIHF U18 World Championships, among several other accolades. Players in their positions aren’t going to profess to want one team or another to select them, but still, the whole process is a lot to take in for kids that barely have to shave yet. Published: June 22, 2017, 8:55 p.m. Updated: June 22, 2017, 11:23 p.m.